If Italy is globally famous for its intricate manufacturing of luxury goods, leather holds an important place within the country’s heart, renowned for its eye-catching bags and striking footwear. Several major fashion players have built their fortune on accessories as opposed to clothing. This is rather different with DROMe, the label headed by Italian designer Marianna Rosati who lives and works in Tuscany. Growing up in a family of fashion entrepreneurs that specialized in manufacturing leather goods for high-end brands, Rosati was always familiar with the craft and intrigued by its possibilities. When her family decided to launch a new project in 2009, she naturally got involved and became Head Designer of DROMe. Rosati’s aim was to push that tradition further, embracing the skills of local artisans while using the latest technology to revive handicraft. Today, DROMe is a sophisticated and innovative brand led by an eclectic and charismatic woman whose unusual spirit infuses her collections with strength and femininity. Walking around her large and luminous showroom in the Marais district of Paris, one is immediately struck by the beautiful colors and textures used within the line. You can distinctly see the different stories in the collection and also imagine how it appeals to several types of women. In a way, one needs to put the pieces on to understand how special they are. DROMe keeps you guessing every season and Rosati seems to delight in the pleasures of illusion. A ladylike pleated skirt, which looks like pure silk, is in fact made of paper-thin nappa leather, which in itself defies the notions of truth and logics. Wearing an eggshell oversize patent leather blazer and vintage spectacles, Rosati is warm and unaffected in person. Despite having to cast the models of her show the day of the interview, she’s completely focused on our chat and keeps bouncing back with relevant remarks. If DROMe is still perceived as a niche brand, it boasts an enviable list of retailers across the globe, all looking for the comfort and subtle luxury Italian craft keeps striving for. We’re two days before your show and you seem so calm. What’s your secret? We already started working on the show in Milan and now we’re going to finalize the casting and styling for Paris. I guess we’re pretty well organized. You come from a family of entrepreneurs who specialize in leather. Did you always know you’d work in fashion? Not at all. I wanted to be a ballerina when I was young, but unfortunately I wasn’t that gifted when it came to dancing. I studied theater and was always into the performing arts. When I was a teenager, I always hung out at the company and ended up doing some small jobs there, looking at color cards or helping select materials. It’s something I always enjoyed doing and I also found it fascinating. The thing is, it was a family business and if felt completely normal to me. I didn’t have any distance from it then to know that it was really special. What drew you to the work? It all started with the materials and what I could do with them. I went to all the fairs trying to learn more about leather and keeping an eye on recent technical developments. Research and education were important to me so I decided to enroll in a three-year program at Polimoda in Florence. After my first year, the teachers told me I was too experienced and that I’d basically waste my time doing the whole course so I went straight to the Masters, which was great for me. I graduated in 2002 and started interning in Milan. At the time, my father and his business partners were managing a brand called Santacroce, which focused on leather jackets and outerwear. We were successful with it, but I think my dad was ready for a new adventure. When DROMe was launched, we used to work with external design consultants, but eventually a position became available within the company’s creative studio and this is how it all started for me. Do you always begin with the material? Yes. I love the engineering aspect of my work, which is key within DROMe. Our company has a laboratory in-house that keeps experimenting with materials and looks for new directions. Before launching the brand, I felt that leather was always used in a similar way and I wanted to challenge that. I wanted to show that leather had endless possibilities, so we worked on a capsule line where everything was leather, treating it as if it were silk or cotton. Did you get a response straight away? We did actually. Vintage-looking treatments were very popular then, and we wanted to work on them, too, but in a more subtle and less obvious way. Lightness was key for me, as well as comfort. We punched leather to make it lighter and found inspiration within sportswear shapes, which people liked instantly. It was a small and rather minimal collection, but we had to put a lot of work and development into it. Buyers were coming in and not believing that it was suede or leather they were looking at, as they had never seen those materials treated that way. We realized there was potential for the brand and I decided to grow DROMe into a proper line, starting to combine leather with other materials. Marianna Rosati and a look from the fall 2018 collection. You’re also doing menswear, bags and shoes. Yes. I do knitwear every season, too, and added pieces that are not leather, in order to offer a complete silhouette. Why show in Paris and not Milan? I lived here for a year and a half when I was younger and have a strong link to the city. We did our presentations in Paris before the shows and it was logical for our clients to come here and look at our new styles. We tried twice in Milan, but Paris is more artistic and has the right vibe for us. There are beautiful spaces to show here as well, and the risk in Milan is to be suffocated by the larger brands. There’s more of an audience in Paris for independent brands like ours. Does the collection reflect your own style? Partly yes, but I don’t believe in designing only for myself. Every season, I try to push my own perceptions and find new ways to approach leather. I think the collection has that multifaceted feel. How do you feel about the controversy surrounding fur at the moment? Large brands are dropping it from their lines. We only use leathers that are by-products of the meat industry and I’d be uncomfortable with the idea of raising animals just for their skin. It’s a limitation for us in design terms, but I understand why designers react this way. At the same time, what we do is luxury, which has nothing to do with need. It’s about love, desire and often narcissism. Ethical luxury is about being able to trace where your products come from and we can do that here, from start to finish. I always look at photographs when I start designing, women’s faces mostly. Each season, I search for a new personality to focus on, an attitude. The DROMe woman is elegant, but also twisted. There’s a certain wildness to her that comes out within the clothes, but it’s fairly controlled and mysterious. She can be daring and dangerous, but you have to get to know her and it takes time. She’s clearly not a maximalist, but she could also wear an animal print head-to-toe. I guess she’s unpredictable and spontaneous. Is there a punk edge to her, too? Definitely. I love London and its cult of the underground. You’ll always find that aspect within my work, but there’s also a disco element. It’s funny to think that punk and disco were popular at the same time. Are there any artists that keep inspiring you? I do have a weakness for David Lynch’s women, particularly in Twin Peaks. His female characters are always attractive and seductive, but you never know what’s going on within their mind. They’re intellectual, captivating and complicated, which is fine by me. 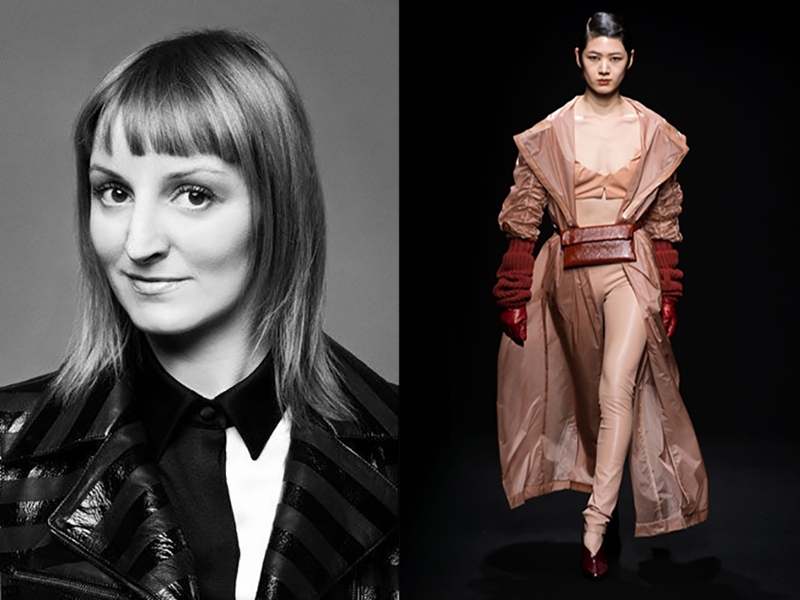 Marianna Rosati is the founder and creative director of Italian brand DROMe, which she launched in 2009. She graduated from Polimoda in Florence in 2002. Despite living and working in Italy, Rosati shows her collections seasonally in Paris during Fashion Week.